Happy Valentine’s Day, paperdoll fans, and you’ve got to admit that even if it looks like it was bought in a store, this is a delightful Valentine’s dress. Brian and I have been into watching Firefly lately, and we’re almost through the series. (So please don’t spoil anything from the movie or the last few episodes just yet; I know River Tam beats up everyone but I don’t want to know any more.) Kaylee, the ship’s mechanic, falls in love with this dress and gets to wear it to a party. In this very same episode Inara wears what may be the most gorgeous dress ever, but there’s just something about this dress that’s so very Kaylee, and probably instantly recognizable to every Firefly fan. Don’t be surprised if you see an Inara outfit here too, or two or twenty, because I swear every episode she wears something new that just bowls me over… but for now it’s all about the layer cake dress. Until I revisit the ‘verse, then, do enjoy these Firefly paper dolls. Holly also did two Kaylee outfits for one of her dolls, which you can find here and here. Thanks also to Can’t Take The Sky, a Firefly fan site with great screen captures. That’s a nice dress! It has a old-fashion feel to it. The thing about Firefly is that it’s a sci-fi series where the artificial gravity stays on when the ship is powered down, where it somehow made sense to terraform a bunch of crappy planets to Earthlike levels, but then truck medicine and *cows* from planet to planet (all within the same, what? solar system? who knows?) at sublight speeds instead of just Calvin cycling whatever junk people need. But the costumes are nice and the show is funny. In our household, 25% of the residents care about hard science fiction, antigravity, plausibility and so on. 25% of the residents care about Inara’s red sari. 50% of the residents care about a warm place to sit and great amounts of wet cat food. This dress reminds me of Scarlet o’Hara’s white dress with red ribbons in the opening scene of Gone with the wind. ha! i remember that awful froofy dress that she coveted ~ what a great reproduction! Yay! Welcome to the firely ‘verse ^-^! I’m a die-hard browncoat so was completely thrilled to dee you had done this ^-^! Oh my gosh, I can’t believe this. Firefly is my favorite show of all time! Thank you so much for putting this up. She was so cute in it. If you like firefly/serenity costumes I recoment the Propstore of London site. You can see the actual costumes from the Movie Serenity. Hi Liana! I absolutely love your paper dolls! 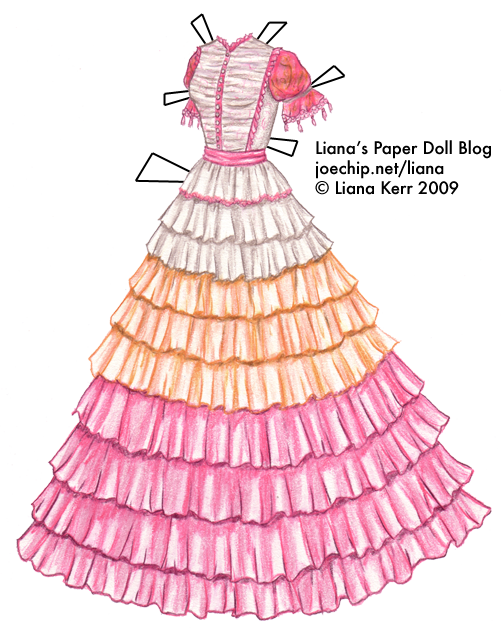 I came across your blog while searching for a paper doll of Kaylee, and this rendition of her ball gown is just gorgeous! I was searching for a paper doll of her because I’m putting together new business cards (I’m a costume designer). My idea for the business cards is this: on one side will be my business info and on the other will be a doll and two outfits that can be cut out. Each year I’ll put out a new one, and they’ll be kind of collectible. I’d like to talk about commissioning some art for this purpose from you. If you’re interested, email me or message me on my etsy. Thanks and you’re awesome!